So you have a space for whatever you are doing. And now you need to become a floor plan creator. The question is, what do you do with it and how can you become a floor plan designer? This can be a difficult question for both people planning events and venue owners. Everyone wants to know what is the most optimal space and how to configure it. Here we try to cover all the use cases anyone may have for any reason they would want to pick a venue. You will also be able to create any of these designs with this floor plan creator from EventForte. So let’s go through the different room types depending on what you want to use the venue for. The hospitality industry has a long tradition now of the different room configurations based on events. 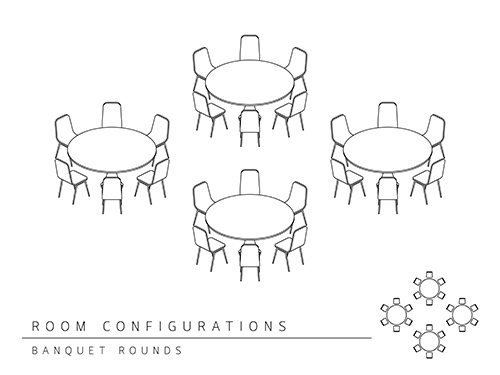 Here are the different room configurations you can create with a floor plan creator. And don’t forget to use a floor plan creator to help you out. 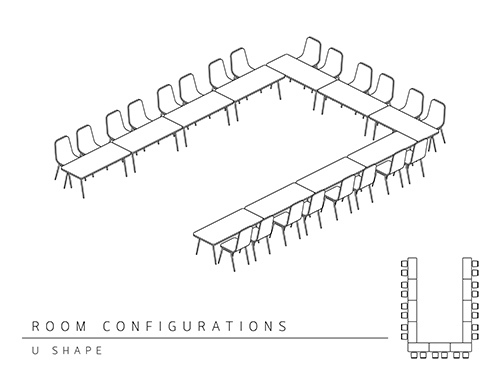 U-shape tables are great for seminars and group meetings. They are set up in a conference room kind of way except that one end of the conference room rectangle is missing. Compact design takes advantage of space in the room. Hollow Square (sometimes rendered as H-Square) setups create a square or rectangular shape where every person is facing opposite someone else. As opposed to the U-shape set up, all sides of the square have a table. This setup is great for screenings, debates, or group projects. There is no central locus in the room meaning every person seated can feel equal to every other person. Allows for engagement with people next to you and across from you. Difficult for mobility since entrance to the center of the square is blocked. What characterizes this setup more than anything else is the giant rectangular table in the middle. The table is usually made out of wood or glass. 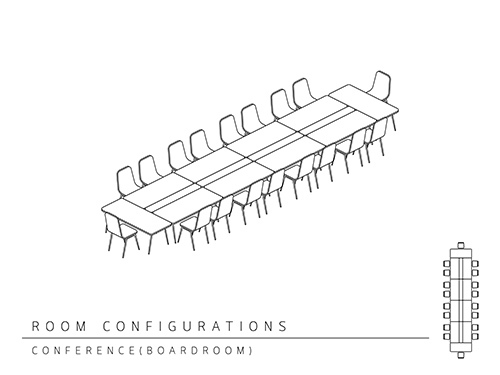 Many venues offer permanent conference table set ups in some of their rooms. There are two basic setups when it comes to banquet seating: “Classic Banquet Style Placement” and “Banquet Round Style”. With Classic Banquet Style Placement, you set up rows of rectangular tables with seats on both sides. The Banquet Round Style utilize round tables and as you can see from the picture, the tables do not need to be in a straight line. This can help you maximize your space. Use Classic Banquet Style if you want heads of the table who merit extra attention for the event. This style of seating is similar to Banquet Round Style except that one half of the table is left bereft of seats. The reason why usually is because all the guests are expected to be facing in the same direction. Due to its use in staged productions, this type of seating is also known as cabaret seating. Mostly for use if the event entails sitting for much of the time. Not a good choice unless everyone is expected to face the same direction for a long duration of time. As implied by the name, this type of seating is meant for lecture style events. It is characterized by chairs and trestle tables arranged in straight rows. Exiting can be difficult as people can feel scrunched in. Audience interaction is lower than with the crescent rounds. 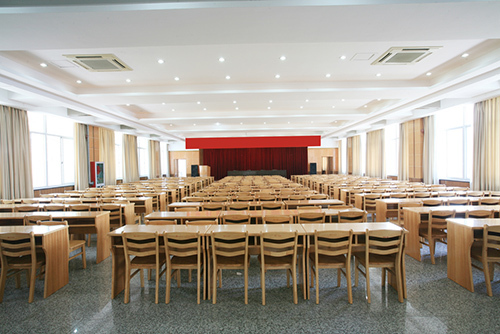 This type of seating is also known as auditorium style seating. This type of seating usually is best for inviting the maximum number of people to an event as there are minimal tables that take of space. It is generally arranged with straight rows of just plain seats using banquet chairs. It is important to leave approximately 2 feet in between rows so there is easy movement in and out of the venue. The chairs should be placed 3 to 6 inches apart to give everyone space. It can sometimes be hard to plan this type of event because you need to have more accurate tools in spacing out the rows so you know how many can fit. I recommend using an event management app like EventForte. 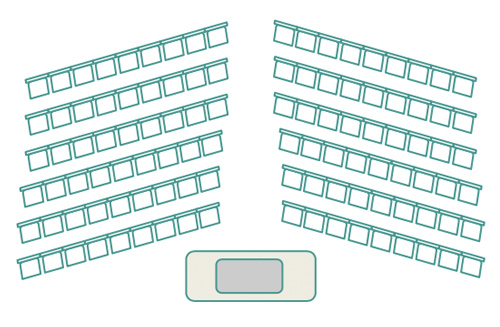 EventForte allows you to put in rows of seats very quickly so you can see how much space you have in between rows and how many rows you can fit. Similar to classroom style, interaction between audience members is limited. Tradeshows are unique in their setup. They are comprised of booths spread out across a venue which allow attendees to go up and interact. What you have to remember is that any type of event that has booths has this type of trade show set up. 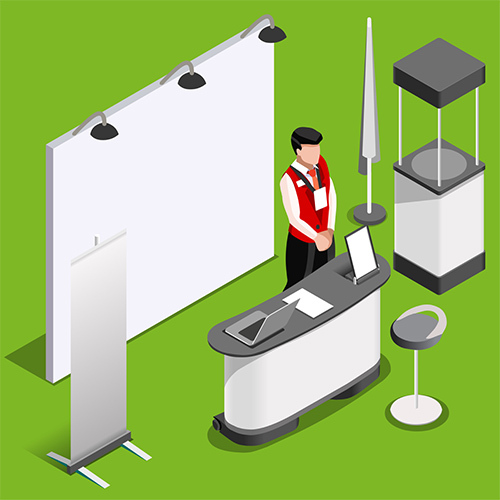 So if the event is geared toward businesses selling food, displaying their products/services, it is all in the realm of tradeshow. Not appropriate for any other type of event. This type of space is characterized by vast quantities of standing space. Of course, this does not mean there is no furniture. Rather the furniture is generally placed against the walls. 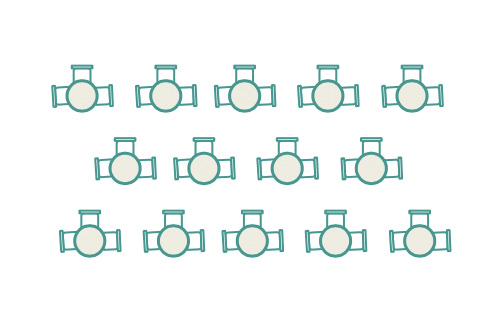 A rule of thumb is to leave enough seats for 10 to 15% of your guests. If you don’t think you have seen this configuration before, keep in mind the seating arrangement on an airplane. Many airlines these days have their seats in herringbone or “reverse herringbone” type arrangements. 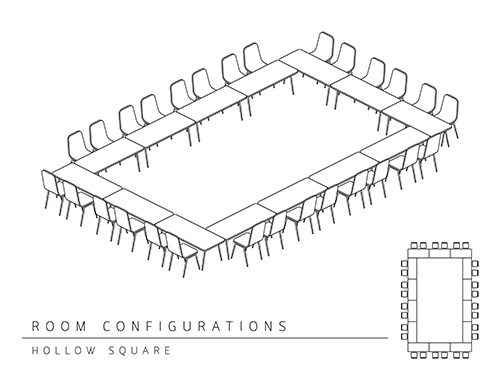 In the event space, herringbone arrangements are similar to the classroom arrangement with the tables angled inwards. Focuses attention of attendees toward a central point even more so than classroom set up. Audience is closed off and it is difficult to move. 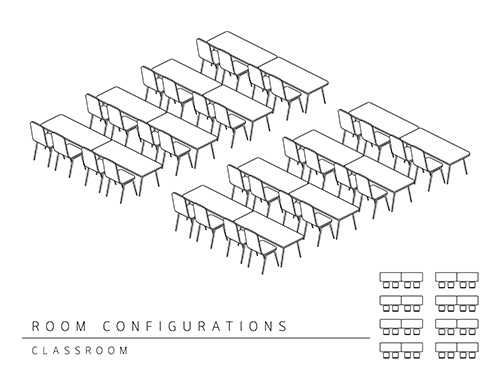 This type of configuration is very similar to the U-shape except that there are no tables. 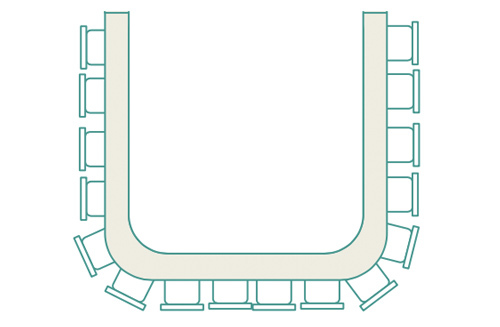 Rather, the chairs are aligned in a u-shape or horseshoe configuration. This type of set up is very popular in classrooms as the teacher can serve as the focal point to the students. Similarly, smaller instructional events are suited well toward the horseshoe set up. 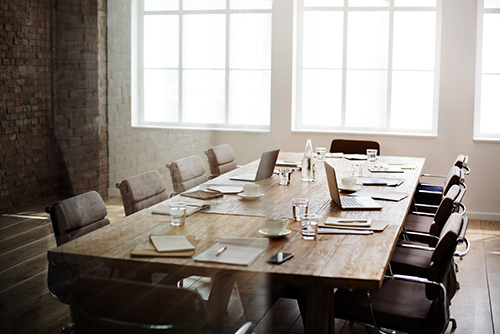 If you are looking to work alone or in a group, the type of configuration you choose can significantly affect your productivity. 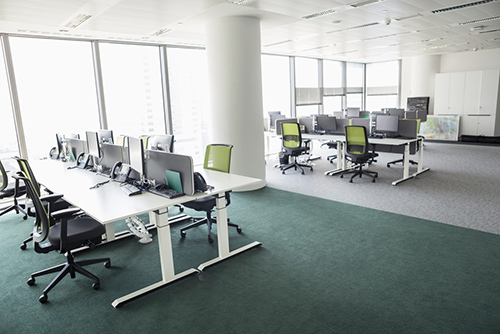 It is being reported more and more that office configurations affect the output of employees. 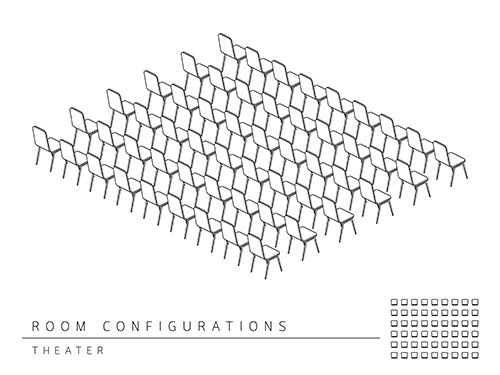 So when you’re choosing where and what type of configuration to use, keep these in mind! And don’t forget to use a floor plan creator in helping you plan these out! It used to be common convention to have your one work station and stick to it. This is no longer the case. Many freelancers and companies are happy to swap desks every now and then, or to switch to the coworking model where you just get a seat and work. If you’re a remote worker and looking for a desk just the day at the cheapest price, this is the way to go. If you want more privacy than you would get with a hot desk, go with the day office. It has already been shown repeatedly that the open office concept which eschewed privacy doesn’t work. Sometimes you just need a private space to work. This can be the case with both solo and group work. Most coworking spaces and even regular office buildings will rent out a private day office for however many days you need. This the classic conference room setup similar to an event. At the center is a conference table. This is great for group work as everyone is seated around the same table. This is the classic mainstay of old office culture such as Dilbert cartoons. And while they are made fun of, cubicles serve a great function: mixing openness with privacy. 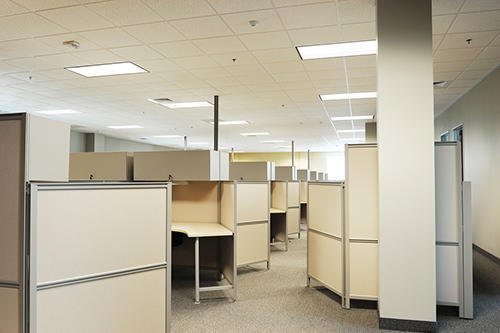 The idea behind a cubicle is to give a sense of privacy in an otherwise open space. It’s essentially a makeshift office. When your team needs space, it is important to consider mixing work and relaxation. You don’t need fanciful designs like these. Rather, you need spaces that can cater to your needs. The wholeness duet is a combination of workspace along with a lounge area. The idea behind the name is that you get a sense of wholeness of work and relaxation in the same space. 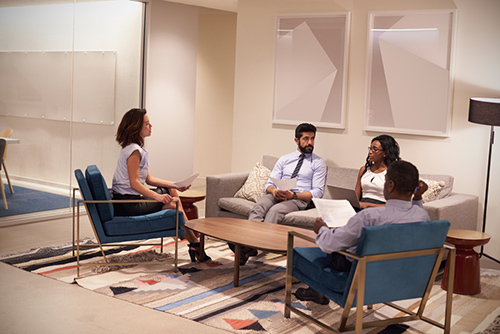 A common wholeness duet will utilize a long table or a conference table and a lounge area such as rows of couches next to it. Similar to a library, sometimes it is great to a familiar setup of long tables stretched for working. Think of it as a banquet for working. It is a good use of space and allows for many people to accomplish work at the same time. Sometimes you don’t know what type of space works for you until the last minute. Or maybe what’s best changes as you are working. If that’s the case, flexispace is the best for you. 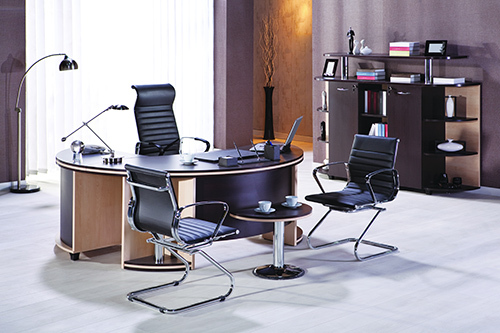 With this arrangement, you are given sets of desks and lounge space and are able to arrange it to your liking. 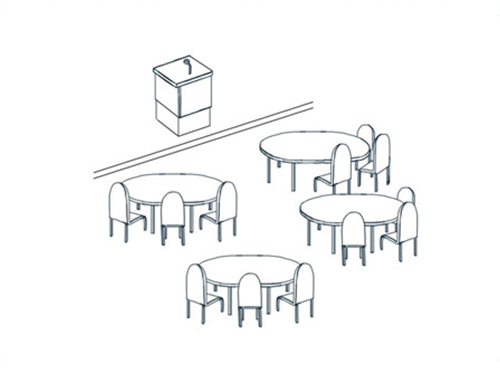 For example, you could have four small desks which can be separated for solo work or put together for group work. Because as we know, one size does not fit all. Not good for people who want to maintain one fixed set up. These are rooms filled with half partitions. Half partitions are a compromise between the cubicle and a hot desk. Having rows of them allows for the option of collaboration should the need arise since communication is simple. One of the latest trends to hit the space scene is that of a popup. Popups shops are commonly used in retail these days for various purposes but they can also be used to host temporary restaurants. Whatever the case, there are different configurations for how to set up your popup and you need to know which one works best for you. And don’t forget to use a floor plan creator in helping you plan these out! This type is suited to the retail popup. The idea is to set up your popup like an art gallery. You want to have your items for sale located against the walls of the space while leaving the middle open. This allows for easy walkways and fun customer interaction. Limits amount of product you can sell as you are limited to the walls of the space. This is taking the idea of a tradeshow booth on the road. With this setup, you essentially have a store in a box. It’s like a small, cozy version of a more conventional retail store. This is a setup that allows you to best set up a popup restaurants. It is a series of tables, linens, and chairs with the necessary elements you’ll need for a kitchen in a separate space. It derives its name from Bon Appetit and from “petit” which means small. Maximizes space and focuses on the cozy, dining experience. Whether a film or photo shoot, you need to choose very wisely when picking a location and venue for your production shoot. It is very important to pick the right space depending on your purpose. This type of setup is essentially a completely empty warehouse. You have complete freedom in such a setup to bring in props, lights, backdrops, everything for your shoot. The space is your canvas and you are the artist who paints it (metaphorically). The ancient Greeks set up their acropolises to allow for theaters. These theaters were set up in a way that allowed for audience members to hear everything going on in the stage. That was quite an impressive feat for a civilization more than 2000 years removed from the microphone. In this type of modern day set up, the acoustic acropolis is a venue that has these acoustics in mind. The wall panels are soft or grooved which can soften noise and focuses sound to the speaker. You wouldn’t even hear an echo. Usually a little more cramped as good acoustics require smaller spaces when enclosed. No matter what you are looking for, you can find it. If you are planning an event, work meeting, a popup, or a production shoot, there is a type of venue for you. At EventForte, we take these concerns about the perfect type of venue configuration very seriously so you can just put it in our floor plan creator and get on planning your event!. Let us know what you think of these setups and configurations in the comments below.